Is this Apple's vision for the iPhone-controlled car of the future? Apple has filed a patent for a device-controlled system that can automatically customise any compatible car with your personal preferences. 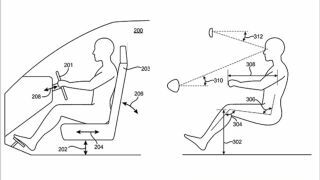 The system for a "self-configurable environment" would use your iPhone or perhaps even iPad or iWatch to adjust aspects of the car, including seat and mirror positioning, climate control, steering wheel adjustment, radio preference and a bunch of other neat stuff. As mentioned, this wouldn't just work in any car - you'd need to be driving something that's iconfigured. But Apple's already bringing iOS in the Car with iOS7, which plans to combine the operating system and Siri hands-free with the dashboard. The plan wouldn't just stop at the car, either. The patent also mentions a similar system designed for the home, altering things like lighting, air condition and entertainment systems. There's less detail on this part, but we reckon this idea seems even more obvious than the car one. Having something that remembers all our favourite home comforts would be a big benefit. We are all creatures of habit, after all. The USPTO filing, titled "Automatic Configuration of Self-Configurable Environments", was made on January 30, 2012 but has only just been published. Who knows whether we'll ever see it become an actual thing.